"Unclear Storytelling Muddies the Facts and the Story"
WHITE BOY RICK is a real-life crime drama about a teenage boy who becomes a drug informant in Detroit for the FBI in the 1980s, but then starts selling drugs himself when the FBI suddenly drops him as an informant. Some unclear storytelling muddies the facts about Rick’s case and actually makes him less sympathetic than the movie apparently intended to do. WHITE BOY RICK also contains abundant foul language and some strong bloody violence. 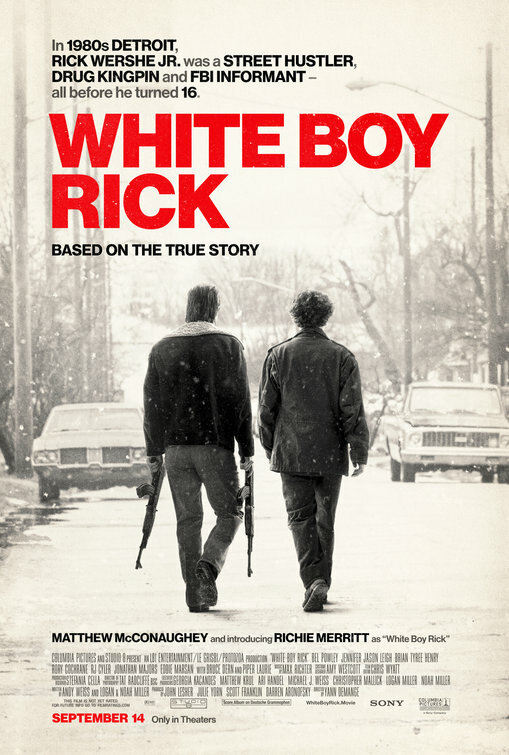 WHITE BOY RICK is a real-life crime drama about a teenage boy who becomes a drug informant in Detroit for the FBI in the 1980s, but then becomes a real drug dealer when the FBI suddenly drops him as an informant. Some unclear storytelling muddies the facts about Rick’s case and actually makes him less sympathetic than the movie apparently intended to do. WHITE BOY RICK also contains abundant foul language and some strong bloody violence. The movie opens in 1984 with 14-year-old Ricky Wershe, Jr. attending a gun show with his father, who fancies himself an arms dealer. After buying a few AK-47 knockoffs from Egypt, they come home to the east side of Detroit to find Ricky’s teenage sister, Dawn, with an older black man. Dawn has a big argument with her father and drives away later that night to live with her older boyfriend. The father makes a couple silencers for the two AK-47’s and makes Ricky go sell the guns to local drug dealer Johnny Curry, who’s about to marry the niece of the city’s corrupt mayor, Coleman Young. Two FBI agents see Ricky go into Curry’s headquarters, and later threaten and cajole Ricky to become a drug informant for them, or else they’ll send his father to jail for selling guns illegally. Ricky is a natural when it comes to undercover work, but he gets shot in the stomach by a rival gang when a drug war with the Curry gang breaks out. The drug war results in a bunch of arrests, including the arrest of some police officers on the take. At that point, however, the FBI no longer has a use for Ricky, so they end their association with him. The FBI also wants to hide its relationship with Ricky because his young age would create a huge scandal for them. After Ricky recovers from his wounds, he decides to go back into the drug business on his own, because it’s clear that neither he nor his father have a way of making a living. Ricky’s decision turns out to be the worst decision of his life. The characters in WHITE BOY RICK are pretty unappealing from the start. The movie manages to arouse more sympathy for them later in the movie’s story, especially when Ricky gets shot, and when Ricky and his father have to rescue Ricky’s sister from a drug den. Also, the actors try to do their best. Otherwise, however, the movie is not as compelling as it should have been. Researching the facts of this case, it appears that Ricky’s drug business had barely gotten off the ground before he was arrested. Also, he technically was arrested for possession of lots of drugs, not for selling. Finally, according to the available record, the FBI deliberately covered up its involvement in using Ricky as a drug informant behind his father’s back. So, given this information, it becomes clear that Ricky eventually was given a much tougher, unjust prison sentence for what he did, when other drug lords from Detroit served much less prison time than he did, even for murder. The real-life Ricky claims he was given a much tougher sentence because his information to the FBI led to the conviction of high-level police officers and to the conviction of the husband of the mayor’s niece, Johnny Curry. The problem with the movie is that it fails to emphasize some of these exculpatory facts sufficiently. So, in the end, except for the harsh prison sentence Ricky receives and the FBI coverup, it’s hard to feel as sympathetic to Ricky and his father as the movie clearly wants its audience to be. A note before the credits about Ricky’s case makes it even harder. The note says that Ricky’s crime was a “nonviolent” offense. Well, that’s just not true. Many people have died or ruined their lives from the kind of hard drugs Ricky was trying to sell. Given that fact, selling such drugs is by no means a “nonviolent offense.” Finally, although the movie shows Ricky selling two AK-47s to the drug lord, it says nothing about the lives that the drug gang might have taken using those two rifles. WHITE BOY RICK makes a good effort at being engaging and worthwhile, despite all the foul language in the movie. Ultimately, however, it’s a disappointing, unacceptable experience that fails to sufficiently condemn the violent drug gangs that became such a scourge in our cities in the 1980s and that remain such a menace even today, 30 years later. Strong miscellaneous immorality such as father of title character is an incompetent hustler who’s a bad role model, but he sometimes makes an effort to be a better father to his son and daughter and tries to get his son to return to school at one point, father and son blackmail a shady dealer at a gun show to sell them three guns at a very low price, man cheats another man out of expensive boxing tickets and cheated man becomes resentful and angry, daughter leaves home to live with her boyfriend, but he eventually ditches her, and mayor’s government and some police are corrupt. WHITE BOY RICK is a real-life crime drama about a 15-tear-old boy who becomes a drug informant in Detroit for the FBI in 1985. At first, Ricky is helping his father buy cheap guns to re-sell. Ricky sells two AK-47s to a local drug lord, Johnny Curry, who’s marrying the mayor’s niece. Two FBI agents see Ricky enter Johnny’s headquarters. They threaten to imprison his father unless Ricky becomes an informant. Ricky’s information leads to convictions of Johnny, some gang members, and corrupt police. However, the FBI drops Ricky as an informant, though Ricky was shot in the stomach. The characters in WHITE BOY RICK are unappealing. The movie manages to arouse more sympathy for them later, especially when Ricky is shot and abandoned by the FBI. However, after recovering from his wound, Ricky turns to selling drugs himself to earn money for his family. Although the real-life Ricky was treated far more harshly by the authorities than other drug dealers, the movie’s poor storytelling dilutes the impact of this fact. WHITE BOY RICK contains abundant foul language and some strong bloody violence.